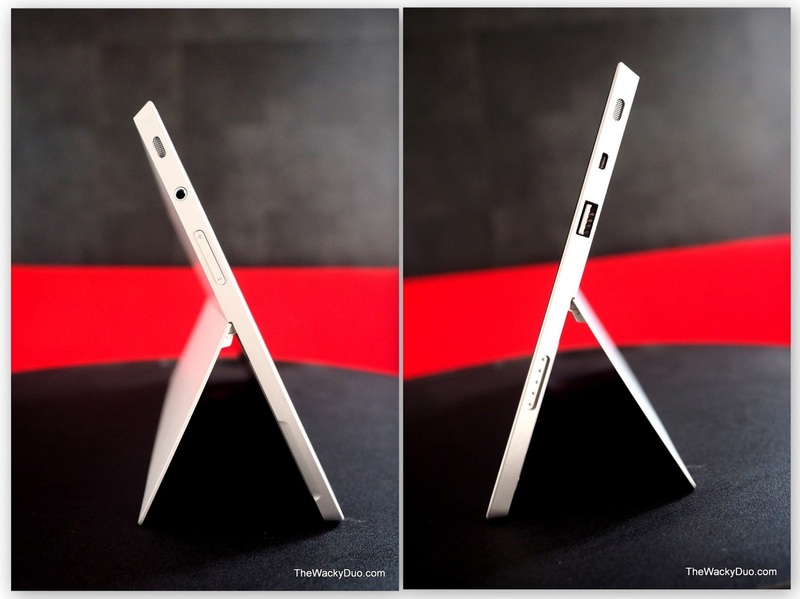 Not too long ago, we attended a Surface 2 launch at MBS. Following that event, I had indicated that it would be great if I could have the Surface 2 a tad longer, so I could explore what lies beneath the surface. Microsoft had heard my 'plea' and they have generously loan me a unit for a few weeks for a trial. As I was looking to upgrade my laptop,I was wondering if the Surface would fit the bill. Being touted as a Blogger's machine with the detachable keyboard , the Surface has the potential to be a replacement laptop as well as a tablet. With that in mind, I decided to test if this machine is truly the Blogger machine as it was slated to be. Let's start with the design of the Surface 2, coming in at 10.6 inch, this is a heavyweight compared to its smaller competitors such as iPad Air ( 9.7 inch ) and Galaxy Tab 3 (10.1). Design wise, it is similar to most tablets with a uniform size lack bezel surround the screen. There is a home button located on the longer size of the Surface 2 which indicates that it is designed more for use on a landscape mode. If you are looking for connectivity, the Surface 2 does not disappoint. There is a full size USB 3.0 port on the side, a mini HDMI output and a microSD card slot. Given that this is only a 32 GB tablet, having additional storage options are a must if you intend to load it with apps or save your pictures and videos. For those hardware fans, the Surface 2 comes with a Tegra 4 processor, a quad core chip at 1.7 GHZ, 2 GB RAM, and 2 cameras ( 3.5MP on the front and 5 MP on the back) In addition screen resolution comes in at 1920 x 1080, making it a HD screen, however it still loses out to the retina displays that is currently the industry Gold standards. Technical jargon aside, the most important question is 'how does it runs'? Comparing to an IOS device or and Andriod device, startup time has quite a significant lag. However once it is up and running, it works as well as the rest of the tablets on the market. Perhaps the main selling point for the Surface 2 would be that it is a serious laptop replacement contender comparing to the existing sea of tablets. The build in kickstand seems to attest to that. With 2 different viewing angles , it provides comfortable positions to view movies or to get down to some serious work. The best design feature would probably be the Touch Covers. Coming in 2 versions, the Touch Cover 2 and the Type Cover 2 , these 2 keyboards are designed to be at one with thte Surface 2. These covers easily clip on to the bottom of the Surface 2. In addition it acts as a cover to protect the Surface 2 when closed. Of the 2 , I would prefer the Type Cover 2 for its excellent tactile response to touch. It comes wih backlit making it useful when working in near darkness. However as a laptop replacement , it falls short on its usage. The keyboard is useful on a desk, but due to the design of the Surface 2 with keyboard, it does not hold up while you place the device on the lap. So as a 'laptop' replacement , it is found wanting. Moreover with a combine weight of over 900 g, it is heavier than some ultra-portable laptops in the market. The litmus test would be if the Surface 2 would replace the current tablets I am using. First off , being a 'virgin' Windows RT 8.1 user, the interface strikes me as rather colourful and inviting. The layout of the tiles ,which can be personalized , is an attractive alternative to the standardized standalone option on the IOS. However it does also meant that there are less screen real estate for the apps per screen due to its layout. Swiping to the next screen is easy to use. The learning curve may be a little steep for an old horse like me, but familiarity sets in after a few flicks. Being a Daddy Blogger with a full time job, time has always been a valuable commodity for me. It is not unusual for me to multitask. With the aid of an additional keyboard, it does make light work of composing a post. Given its portability, I could easily plonk down on the sofa, enjoy my EPL games while churning out a decent post. All these done in the wee hours of the morning when the boys are asleep, no less. Perhaps the most important selling point is the availability of Microsoft office on the Surface 2. If you are using Office in your *ahem* office, you would easily use the Surface 2 for work. However since the evolution of apps and many other alternatives in the market, the use of Office had diminished. For me that is not the deal maker. Given that it is specifically the Surface 2 competitive advantage among the rest of the tablet world, it is one reason that would not entice me to pick the surface over the others. As mentioned , the Surface 2 works best on landscape mode. With a screen aspect of 16:9 , it is a beautiful device to watch those Youtube Videos. At portrait mode, it is a little unwieldy to hold , especially with one hand. However with the longer screen, more can be displayed, thus reducing the number of scroll downs. A necessity considering the size and weight of the device. It is not unusual that children have a share of the parents devices in today's world. We do encourage our children to experience technology but I zest rests it does not act as a substitute to parenthood. Thus it will be good if there are sufficient quality apps that would not only entertain but educate the little ones. On the surface, there seems to be good apps one can consider such as Sesame Street and Cat in the Hat. However the quantity and variety are much reduced in the sparse Windows Store. Other things to note is that each Surface 2 comes with an additional complimentary 200GB of SkyDrive and Skype WiFi.Do note that the complimentary 200 GB is only for a period. In addition, Skype WiFi is a relatively unknown in Singapore with its limited hotspot. Yet for one who relies on Microsoft Office intensively outside of work. The Surface 2 would be a great option to use compared to the more expensive laptop choices. The Surface 2 has great potential, but with the other options in the market, it may not be easy to justify it as the número uno choice by default. Which is the bigger deal?